Don't you hate it when you're sure you're going to love a book, but you just can't seem to get into it? 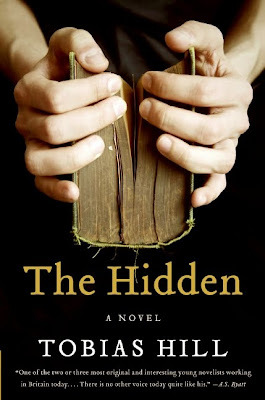 That's how I felt about Tobias Hill's new novel, The Hidden. The premise sounds interesting: Ben Mercer, an Oxford student running from a doomed marriage, joins up with a ragtag group of archaeologists searching for the secrets of ancient Sparta. The back cover's blurb hints that "there is more to the group's dangerous games and dynamic than he [Ben] understands. And there are things that should always remain hidden." Intriguing, no? Unfortunately, the book moves so slowly that I never got to the mysteries promised by the blurb. I gave the book 50 pages (which I feel is generous considering how many books I've got waiting for me), then abandoned it. My ambivalence has nothing to do with the writing itself. In fact, I quite enjoyed the excerpts from Ben's "transcripts" that are interspersed throughout the story. I just couldn't make myself care about the characters or plot, and I didn't see them growing on me either. So, that's that. Except I feel a little guilty. I always do when I can't finish a book I promised to review. Because I don't want the book to get short-changed just because it's not for me, I'm going to offer it up to one of you. This is an almost-new trade paperback that came to me courtesy of TLC Book Tours. All you have to do to make it yours is answer this question (and win the drawing, of course): What books have you been sure you were going to like, only to find out you, well, didn't? Or vice versa: What books have you been certain you were going to loathe only to find yourself really liking? I'll draw the name of one winner on November 16 (my son's birthday). Contest is open internationally. Good luck! In nothern Greece in 2004, a close-knit group of archaeologists searches for the buried traces of a formidable ancient power. A student running from a failed marriage and family, Ben Mercer is a latecomer to their ranks, drawn to the charisma of the group's members - to the double-edged friendship of Jason, the unsettling beauty of Natsuko and Eleschen, and the menace of Max and Eberhard. Bun Ben is far too eager to join the excavation project, and there is more to the group's dangerous games and dynamic than he understands. And there are things that should always remain hidden. A novel of astonishing grace and power from award-winning author Tobias Hill, The Hidden brilliantly explores the secrets we keep, the ties that bind us, and the true cost of fulfilling our desires. It really does sound good, doesn't it? I love Pride and Prejudice, so I thought for sure I would love Pride and Prejudice and Zombies. Not so much. I thought I would like Wicked but it was kind of icky. I didn't finish it even though I kept trying. I never ever thought I like Bulgakov's Master and Margarita, but the heck, I did, I loved it. I thought I would love The Time Traveler's Wife, but dang if that isn't an albatross around my neck right now. I thought that I would really like the book "Rattled" by Debra Gallant, but I struggled to get through it. There were some funny parts but not enough to make it be a book I'd recommend. Don't enter me, but I got to the last book of the Great and Terrible Beauty series... and couldn't get more than halfway through it. It's so frustrating to not finish a series! I liked the first two well enough, but a coming of age story should NOT be told in first-person-present-tense! Life lessons aren't realized without backward reflection. They just aren't. Did the same with the Luxe series--too many hits just kept on coming and I stopped trusting that we'd ever get to a happy ending. I think I read the first chapter or so of the third book. Oh, that does sound good - sorry it didn't work for you! I should have absolutely loved Shadow of the Wind by Carlos Ruiz Zafon: plot elements I like, very similar in tone to The Thirteenth Tale (which I did love), but man, it was a struggle to get through it. I thought I would love Savvy and I hated it. The Shipping News. I like everything else of hers she's written, but I just couldn't get into that one. I really thought I'd love Joyce Meyer's Any Minute. I tried and tried to get into it. Each night I could only read a few pages. I almost completely abandoned it mid way. But I persevered. I did finish the book. We did "Doomsday Book" by Connie Willis for book club. Time travel and the black plague. I thought I'd hate it, but it sucked me right in. I'm also with the person who mentioned Wicked. It was yucky. I really thought I would love Wuthering Heights... after so many references to it in the Twilight books, I really wanted to read it, but halfway through I gave up. I just couldn't get into it at all! I agree w/ the commenter re: 'wicked.' I did not finish the book. I thought I would love THE NATURE OF MONSTERS by Clare Clark. I read a lot of really positive reviews. I was surprised by how much I disliked it. I was very disappointed. I'd like to give this one a shot, though. I like books set around archeology, and the myterious nature appeals to me. Thanks for your honest reaction and for your willingness to pass the book along. I thought I would like Julia and Julia-could not stand the book.